I’d been having a hankering for ziti. 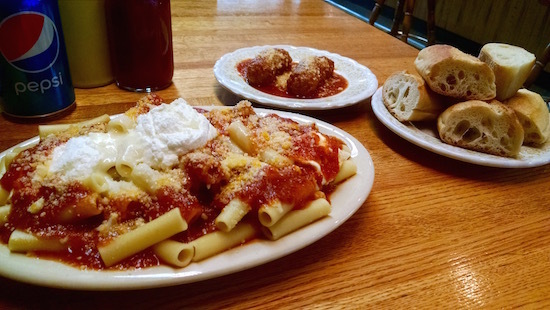 Not just any ziti, mind you, but the ziti and ricotta with meatball at my regular Saturday lunch place, Piccolo’s. Except, ziti hasn’t been on the Saturday specials board this winter. The fellas behind the counter told me that Monday through Thursday, I could get ziti. I’m not real crazy about change but figured, sure, I could come on a weekday one week and get my ziti. Today, a Thursday, seemed like it could be the day. Now, one thing about me, I dig efficiency and multi-tasking. And it seemed I could accomplish a few different tasks during a midday jaunt. My friend and neighbor Dianne had a repaired jacket ready for pick-up from Victor, a Russian guy downtown. Dianne works odd hours at a hospital, and with my “flexible” schedule, I’d taken the jacket to Victor in the first place. (I’d previously taken it to our friend Yvonne the Italian tailor, but the heavy-duty zipper work was outside her skill set. So she’d recommended Victor.) Now the jacket was ready. OK, so I’d return the due-today DVD at the library. Then walk downtown and get my ziti. Then deposit a check at the ATM. Then fetch the jacket. And also bring Victor the two bottles of wine that Yvonne had for him, so I’d have to to get those before going to the library. Then back home. A nice circle. At about 12:30 pm, I called Victor to make sure he was in the shop. He was. “So I can come this afternoon?” I asked. “Call before you come,” he said in his older-guy Russian accent. “I’m calling right now,” I pointed out. “I’ll be in and out today,” Victor explained. “Give me half an hour, I’ll come now,” I said. I wasn’t happy about this; it screwed up my circle. I’d now have to do wine, jacket, check, ziti, library. I didn’t like pushing the ziti back in the schedule — if you didn’t get to Piccolo’s early enough, they’d run out, and erase it from the specials board. Figured I’d better get crackin’. Yvonne gave me the wine, and said I should make sure to get the jacket before giving the bottles to Victor. (The secret world of clothes-mending is a mysterious one.) Yvonne also asked if I’d mail a letter for her. No problem, I could easily slot that in between the library and home. 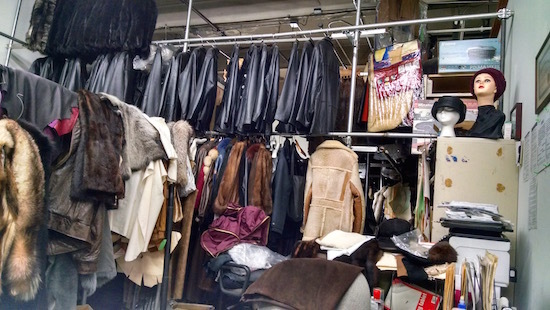 Victor buzzed me into his shop — a large, industrial, high-ceilinged space with racks of leather coats and hats for sale in the front, and a workroom in the back. I took out the five $20 bills Dianne had given me; she’d been told the repair was $90. Victor took four of the bills. “Do you have change?” he asked. I did not. I’d had a $10 as recently as yesterday afternoon, but then I’d run into my dentist Dr. Stern and her daughter, and — long story short — I now have a box of Thin Mints and a box of Tagalongs on order. I dug in my pocket and counted out a few singles and some loose change. Victor did the same. Segundo, the Ecuadoran guy in back, couldn’t break a twenty either. I figured I’d take whatever change they could scrounge together, but then noticed a credit-card reader mounted on the wall. 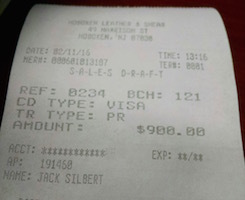 “Would it be easier if I charge the $90, and just keep the cash?” I asked Victor. He was very enthusiastic about the idea. Victor swiped my debit card and handed me the receipt to sign. Jeez, I thought, I’m glad I didn’t give him the wine yet. And I was a fairly rattled — just two days earlier, my bank account had been very, very low — like, limbo-stick low – and I’d had to move some funds around. So I was pretty gun-shy about a near-grand suddenly vanishing from my balance. Victor apologized profusely, called the customer service number, and explained the situation. A solution wasn’t instantaneous (funny, because the transaction itself only took a second), and now the phone had been handed to me. Customer-service rep Kristy explained to me what she’d tried to tell Victor: She could void the $900 and enter in the $90. Or she could just void the $900, and I could give Victor $90 in cash. (In the interim, another customer had given me two tens for a $20.) But Kristy didn’t recommend that second option, because then I’d be out another $90 while the transaction was resolved. I asked what the quickest method would be to get my $900 back. Kristy explained that on her end, it would take a few days, and that I might want to call my own bank directly to see if they could stop payment right away. So next I was speaking to Mindy at Bank of America. She’s based in Chandler, Arizona, and warmly thanked me for being a preferred customer, with them since 1994. (I didn’t want to split hairs, but I’d originally signed up with NatWest, which begat Fleet Bank, which begat Bank of America.) OK, Mindy, let’s skip the niceties and try to get my nine hundo back, shall we? Mindy had to run this by someone else and put me on hold for quite a while. When she returned, she apologized that there was really nothing they could do right now. The transaction hadn’t posted yet; it was still “processing.” When it did post, then we could dispute the charge. In the meantime, couldn’t the merchant’s credit-card company cancel the charge, Mindy wondered. Sigh — we’d have to call Kristy again. Victor placed that call but was nervously glancing out his glass front door. It was a street-cleaning day on his side of the street. (I could certainly relate; as a reminder, I place a small piece of paper marked CAR by my bathroom sink the night before street cleaning.) It was about 2 pm — I’d been there about 45 minutes, and it was not looking good at all for my ziti — and he’d have to move his car soon to avoid a ticket. Probably not a NINE-HUNDRED DOLLAR ticket, but I digress. Victor reached a customer-service gentleman but they were not comprehending each other. We needed Kristy! Victor was put on hold, so he apologized to me again, handed over the receiver, and dashed out with his car keys. And soon I was speaking with Jennifer. I recapped the situation and we again agreed to the voiding $900/entering $90 plan. The person to do it: Me! Jennifer talked me through entering the “void” function on the credit-card machine, the approval number from my receipt, my debit-card account number, the amount (which was $900, if you’ve forgotten), and a reference number provided by her. Voilà, the machine spat out a VOID receipt, printed in red for good measure. Easy-peasy! With a few more buttons pressed, I’d charged myself $90 and signed a new receipt. Jennifer alerted me that it would take a few days for the transactions to be finalized. I also had a nice talk with Segundo. 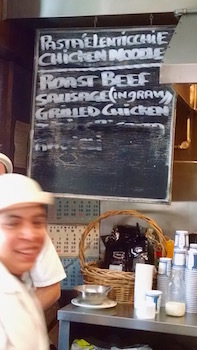 He’s been in the business 45 years, first in his country, then in Manhattan, and the past five years in Hoboken. Used to have his own tailor shop, but things started getting rough for the little guy about 20 years ago. Victor, who’d returned, proudly showed me a 40-year-old Western-style jacket he’d done a major repair on for a “Hollywood producer.” The fellow was going to pick it up in person when he next visited his brother in Newark, and the brother wanted a custom-made bomber jacket. Though I would’ve loved to stay and chat, my work was not yet done. I presented Victor with his wine — he hadn’t really earned it, but I didn’t want to carry the bottles anymore — packed up Dianne’s jacket, and took my leave. At the ATM, the machine held onto my card during the transaction “for added security.” Hmm, that wouldn’t be because of some very recent suspicious activity with my account, would it? I took a deep breath and entered Piccolo’s. It was 2:40 by now, so my ziti hopes weren’t very high. 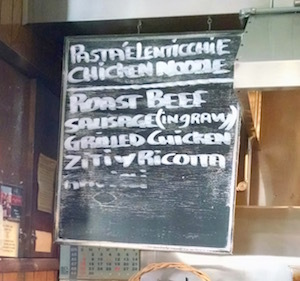 I glanced at the board: Ravioli was done for the day… but ziti and riccota was still up there! Hmm, meatball wasn’t a special, sausage was, but hey, I can adjust, right? A few minutes later I had my ziti. It was the last one of the day. Content at last, in quick succession I returned the DVD, mailed the letter, and left the jacket outside Dianne’s door. And then made a mental note to check my account balance online in a few business days, and every day thereafter for the rest of my goddamn life. I’m typing this reply with garlic breath! They’ve tossed in some Roman numerals and double-digits, yeah. Gotta keep out the riff-raff. Well this riff-raff for one will not be kept out! Until they start requiring differential equations. Am I the only one who didn’t know the term “high-ceiled”? Hm, embarrassing (I probably would have said “high-ceilinged” — but that’s probably incorrect). Well, I do now, so thank you Jack Ziti. You’ve eloquently made ziti out of meat balls. Or sausage out of receipts. Or something. But you seem to know exactly how MY days go. . . .
I’m frustrated on your behalf. This is even more maddening than the calls to my health insurance company where they transfer me four times. I’m glad you got your ziti though. And I hope your moola has returned by now. Yay!